Young, obscure, but desperately hopeful: Part I – The roar of women's silence. Days after the mass student protests across South Africa have died down (although we continue to stand and support UWC as they demand justice), I’m reflecting on what happened in the country I called home for four years. I am in awe of the strength and courage my friends and former classmates have shown in the face of violence, aloof and detached political leaders, and the constant erasure of black students’ histories. I applaud all of you for standing in your truths and making a difference that will benefit your children. All of this got me thinking about what I and other young Zimbabweans will leave to those who come after us. I wonder about whether we all want the same thing, whether forming a coherent movement is something we could or even should do. I wonder about the prospects of fighting the injustice that pushes the youth further and further away from the resources our parents and grandparents fought for us to have. I wonder about this elusive ‘mission’ that our generation has in our country. Do we have one? Do we even want one? If we have one, are we fulfilling or betraying it? Obscure (adj.) – not discovered or known about; uncertain. I have written about my privilege before and the bad taste it leaves in my mouth because it was and is at the expense of something or someone. I am acutely aware of it, particularly when I’m home. I recognise that my opportunities in life have largely been because of my privileged prior education and a father whose occupation and political position afforded me this. I am aware of the sacrifices that went into creating the country I now call home, and the violence and pain that came as a result of it. I am also aware of the choices our government has made over the years to enact policies that were emancipatory in nature, but did not deliver the level of emancipation citizens had hoped for. I am aware of the beast of the global economy and neoliberalist frameworks and ideologies that continue to emphasise high growth for development, and how difficult it is to form emancipatory politics for indigenous peoples in such an environment. I am aware of just how much work needs to be done to ‘fix’ our country, and that my generation is next in line to carry out this ‘fixing’. And yet…I find myself in this ‘relative obscurity’. I feel somewhat helpless and uncertain as a young Zimbabwean today. I find myself wondering how to even begin to tackle the formidable systems of bad governance, misrepresentation of facts, a lack of accountability of government officials and entities as well as big business, a patriarchal, misogynist society, and a less than satisfying legal system. We know what we’re up against, but do we know how to change it? Violence begets violence, and the government perceives any slightest challenge to their authority as violence against them, that warrants riot police and batons. I am constantly speaking and tweeting about the state of our country, and I am constantly hearing the same thing from young people: we are tired of mediocrity and failures, but how do we fight the system? Again, that relative obscurity – that uncertainty and fear. I remember when I was in high school in 2008 before the elections. I went to a private school and lived in a low density area so of course physical political violence wasn’t something I was familiar with. My privilege blinded me. My cousin however, went to a school where kids were missing school because they had been rounded up and forced to go to a rally to chant and shout slogans. Refusal to do so was punished by beating. Scores of youths were effectively taught that in order to succeed, your lifeline must be linked to Zanu’s machine of mass connections, wealth and resources. That the violence against them and the violence they were being recruited to enact was for the greater good of the nation. Their thoughts, actions and dreams had to be in line with the party’s. Their very words had to reflect a deep love and commitment to this ongoing revolutionary movement, or they were out of line and were to be disciplined. To add to this pain was the sight of their parents who fought day and night to keep food on the table, often too stressed or worn out to even consider fighting the powers that oppressed us all. 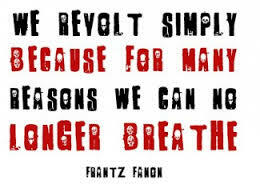 Have we not reached a point where, as Fanon says, “we can no longer breathe?” Is the air not thick with structural violence and the stench of broken promises? At whose expense are we ‘breathing’? Have our lungs become so accustomed to the smog that we’ve learned to survive? Have our eyes not watered with the level of patriarchy oozing out of our society? Or is it because in our privileged logic we took some oxygen tanks as we climbed the ladder of wealth and it’s just business as usual. Where does or should change come from? From the government? Because that seems a little unlikely to me at this point. We are disengaged from the state’s logic of it being the bearer of liberation and freedom. The state isn’t working for most people. Do we have a mission? Broadly speaking, yes, I think we do. Right now however, I do believe that we’re going about our own singular missions. Getting degrees or finding work, trying to stay afloat and trying to stay as far from anything that may jeopardise our singular missions. We’re hustling on a street corner or burning the midnight oil in a dorm room, or praying for a call-back from an employer, or starting businesses we’re afraid will not work. We’re trying. We’re moving carefully and recklessly simultaneously – redefining and restructuring our lives so we maximise the opportunities that were afforded us. Some of us are doing well, and some need more time, and most still need the support structures that a state should be providing. The point is that we’re constantly moving and thinking and worrying about our futures, but our singular futures. And I think this was something life taught us to do. We know our country needs fixing and we know what kinds of obstacles await us were we to try and overcome them. But we have no cohesive movement. Should we be thinking and redefining and restructuring together? I think we should be. Part of being young and obscure means that you have no certainty and you’re not set in stone. And I think that is something we should be seeing as a strength. We have so much knowledge, we are aware of so much. Why aren’t we using it collectively to start shaping the country we want to pass on to the next generation? Perhaps we should be finding this elusive mission for our generation apart and together. Apart we’re doing the best we can, and trying to make as big a splash as we can. But maybe it’s time to really sit and have a think about what we want, why we want it, how we can make it happen, and what resistance we’ll face. And maybe it’s time for those who can breathe and who profit off of others not breathing to share the oxygen. This is one of the most thought provoking articles I have read this year. It makes me think around myself, my life and what difference I make in ensuring that the next generation is thankful. Our mandate as the young generation is to make a difference, question is…….while we know what we need to do, we are failing at implementation level. Your article speaks truth in every sense. I hope it’s the start of a more pragmatic engagement with regards to our country. It’s evident many of us can no longer breathe, but the decades of institutionalised state repression have seen a slow death of youth resistance in our country. However we need to arrive a t a point where we agree that power concedes nothing without demand. It’s our mission to regroup and return the power back to the people, its rightful owners. Its up to us to start critically engaging with our national conscience, to re-evaluate ourselves and collectively build courage to face this system that we also continue to sustain by remaining silent. The tears of our “vending “mothers who are subjected to sanctioned state violence every day. The pain of broken families that have had to live far from home because of a “better” life. The pain of losing a loved one in a state hospital because of lack of medication, but state officials are busy “capitating” at PSMAS. The pain of broken a judiciary and policing system, that continues to institutionalise violence. Our struggles are many and complex. But may we be the selfless generation that stood for the right thing. the time is now Zimbabwean youth. Ours is a mission to build Zimbabwe. This was a good read. Something to really think about.